The Pixel is kind of, sort of exclusive to Verizon. Actually, Verizon is the only carrier that can sell the phone directly, but Google sells them online as well. Then there's T-Mobile which offers account credits if you activate a Pixel, and now Sprint is doing the same. However, it's not advertising the promo, and you might have to ask nicely in order to get it. This promo is being sent to select customers via email, and it appears you need to actually have it attached to your account in order to take advantage. 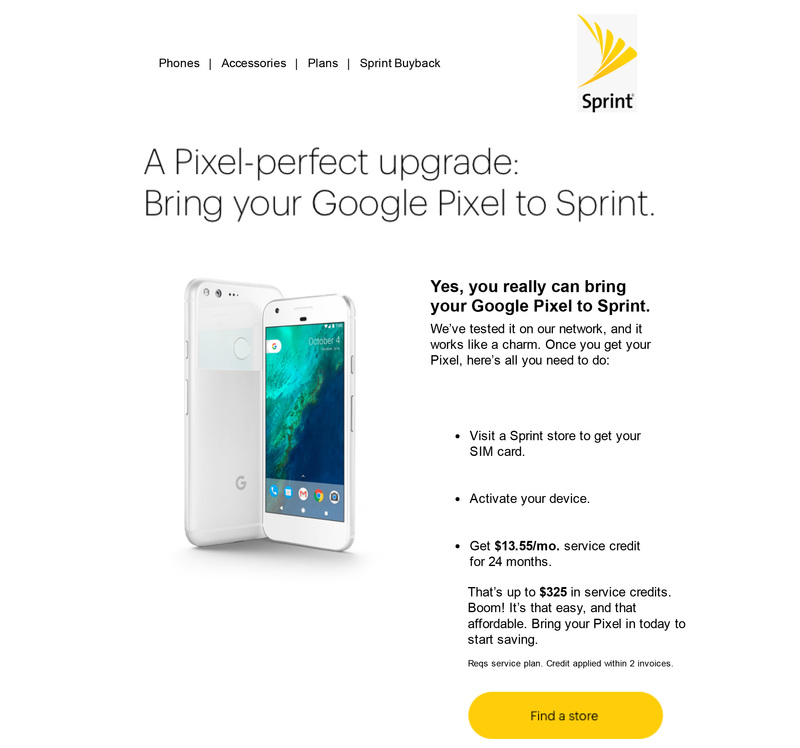 According to a Sprint rep our tipster talked to, the credit is $240 for a Pixel and $325 for a Pixel XL. That amount is delivered in equal monthly credits over the course of 24 months. So, $13.55 for the XL and $10 for the regular Pixel. If you didn't get the email, contact Sprint support and ask about the promo. Again, our tipster was able to get the deal added to his account by chatting up a support rep. After that, you just need to activate a Sprint SIM card in your Pixel. This should be available to new and existing customers, but requesting the promo might be trickier if you're not a current customer. Store reps may or may not know how to add it. Keep in mind, the promo only runs through the end of the month. Pixels are in short supply, so you'll need to already have one or be expecting it to arrive in the coming days to have a shot at this.